Everyone loves picture messaging – or at least, they love the idea of it. The iPhone carrying masses clamored for it, then celebrated once they got it by sending everyone pictures of their immediate surroundings and beloved pets before forgetting the feature exists. After the novelty wears off, it’s generally reserved for the occasions when there is genuinely something interesting to show. Need the wife’s advice on whether to buy the blue shirt or the green one? Picture message. Want to ask her out to coffee? You’ll probably stick with text. FunMobility, a company thats been cashing in on cell phone media (like ringtones and wallpapers) since 1999, is looking to change that with FunMail, a service which they’re dubbing as “every-day picture messaging”. The user picks the graphic they want, and off it goes via MMS, Facebook, or Twitter. As it’s sent from mobile-to-mobile in the standard MMS format, the messages should appear just fine on any picture messaging-enabled handset, whether it has the FunMail app or not. If FunMail were charging the user for this, it’s hard to imagine that it’d see much use — it doesnt, after all, add anything but a bit of fun to the conversation. Fortunately, they’re not charging a cent. The service is free to the users (save for any fees surrounding sending/receiving MMS), with FunMail planning to make their money via partnerships. Carriers ought to dig it (and thus potentially pay FunMail to port it to other handsets) because it could increase MMS revenue, while the context-sensitivity opens the way for promotions. 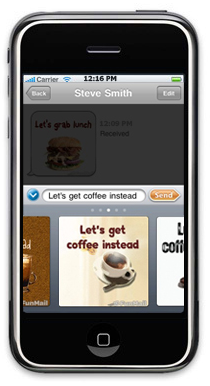 If instead of “Want to get coffee?” you typed “Want to grab Starbucks?”, FunMail could offer up a Starbucks coupon as a message graphic to seal the deal. It’ll be interesting to see how well this takes off. As it’s climbing onto the shoulders of an already well established communication method and they’ve watermarked each picture they send, there’s some aspect of virality here. It does seem a bit extraneous to tack a picture onto a message that would be perfectly acceptable as just text – but that’s something that happens many many thousands of times each day across the social networks.